Kart_Lab, this is the name given to the joint venture between the Karting division of multiple championship winning team ART Grand Prix and the Automotive Group of the Mechanical Engineering Department, University of Brescia (DIMI). 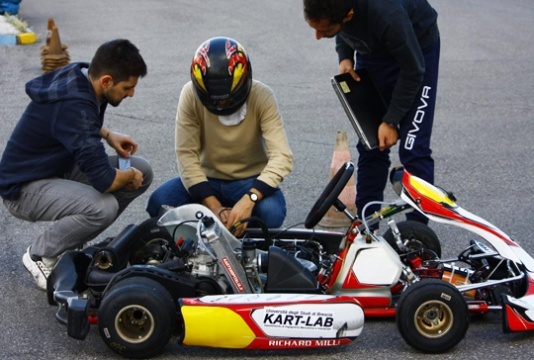 A programme set to study, test and find new solutions for kart performance with the help of an entire University department, involving professors and students alike with on-track sessions as well as introductory lectures on data acquisition systems. The first of a series of tests was held at the Autodromo di Franciacorta International Circuit near Brescia, northern Italy, on 15th April, using an ART Grand Prix chassis powered by a Rotax Max engine, equipped with a Magneti Marelli data acquisition system. The test was carried out mounting several sensors on the kart, such as accelerometers, GPS receiver of speed and race line, axle and front wheels speed, steering wheel and throttle sensors, rear and front braking system sensors, and IR sensors for tyre temperature. The Kart_Lab research and test programme, aimed at increasing the on-track efficiency and performance of ART Grand Prix equipment, will provide a unique, unprecedented opportunity of development for a Karting team introducing next generation performance solutions. The next test session will be held on the same facility on May 5, and will see the Mechanical Engineering students of the University of Brescia introduced to data acquisition system technology by a series of lectures. The kart will also be on display on May 23-24 in downtown Brescia during the UniBS Days, an event aimed at introducing the city university to secondary school students and citizens.